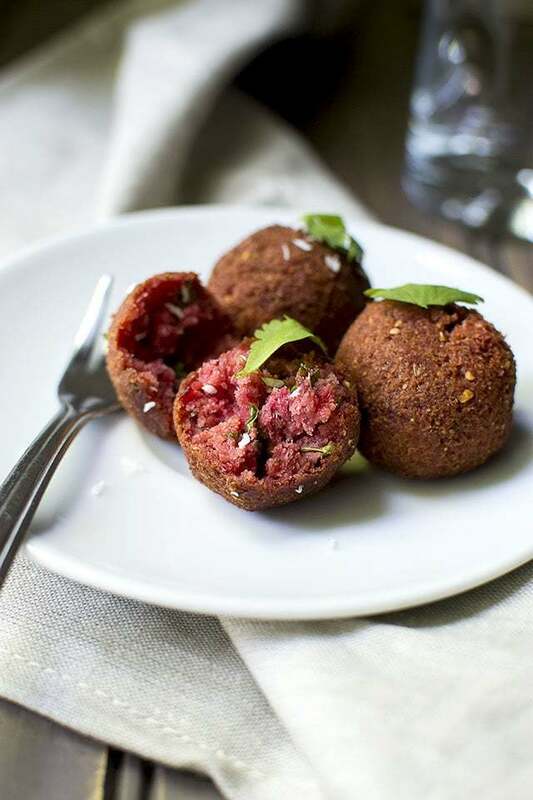 These Chettinad style Beet Croquettes aka Kola Urundai are spicy, delicious and melt-in-your mouth. Powder the roasted gram dal and keep aside. In a blender, combine coconut, onion, red chilies, ginger, garlic, fennel seeds and cashews. Pulse to form a coarse paste. Do not add any water. Add the grated beets and blend into a coarse mixture. Remove the beet mixture into a bowl and add the roasted gram powder, salt and cilantro. Mix well and make small gooseberry sized balls. Heat oil for deep frying on medium heat. Gently add few beet balls and fry until golden brown on all sides. Remove with a slotted spoon onto a paper towel lined plate. Repeat with the remaining beet mixture. Serve warm or at room temperature as a snack or a side dish with rice and sambar.